I used to tell people that if they wanted good food in Nashville, they should avoid downtown near Broadway. 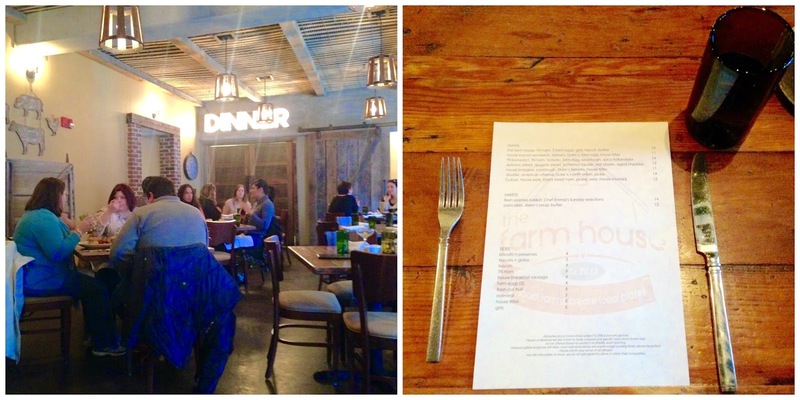 Lately, I've been discovering there's more and more to offer in the area, especially as the SoBro neighborhood continues to grow: The Farm House is one of the good ones. In fact, before my cousin came to visit from L.A., he specifically requested to eat here. Since it was Valentine's Day weekend, we figured a brunch/lunch reservation would be best, so we went on a Sunday at noon. I highly recommend a reservation! There is also free valet, which I love. The overall restaurant feels small and long, and definitely gives you the "barn" feeling I'm sure they're going for with the reclaimed wood and things. There's also a bar where people eat, not sure if that's first-come first-served or what. They also serve brunch options on weekends. 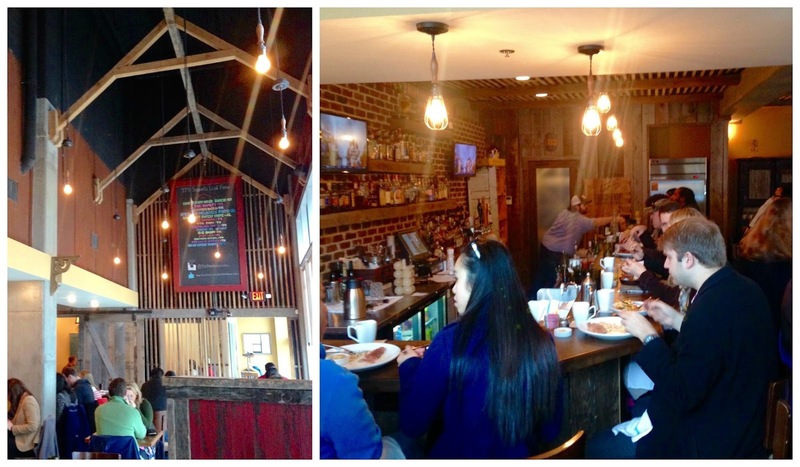 The glasses were upcycled wine bottles, and they have a very extensive bourbon/whiskey menu! Overall, I wish there were more lunch options vs. brunch options on the weekend, but we're a brunch culture in Nashville. The menu is not extensive, because it's all made to order and fresh... it's all about what's seasonal, available, etc. In the spirit of brunch, I ordered a side of biscuits and preserves for the table. The biscuits, jam, and butter were all excellent. It was all tasty, though I might argue that for the South, $4 for two biscuits is kind of steep. Maybe I'm just used to complimentary biscuits everywhere? I expected there might be 3-4 for that price. For my meal, I really wanted something with meat, because I'd heard they are really deliberate about where they source their ingredients. I chose the Cuban sandwich, which had the house pork, black forest ham, and Swiss. It came with their house fries and house ketchup. I LOVED the Cuban. The bread was so fresh and good, it really made the sandwich amazing. Seriously, when a restaurant nails the bread it is such a win. The meat and cheese were also great. The fries were pretty good, though I did not like the house ketchup. It tasted a bit fruity or jam-like, not like ketchup really. The fries tasted good without it, and I appreciate that they make their own sauces! Overall, I'd definitely come back to The Farm House. I know that every time, the menu would be different, but the food solidly good. I would love to try a cocktail next time too! I remember passing this restaurant. I told Corey it needed to be on our list. The plating leaves a little to be desired in my opinion, but good food can make up for plating. Corey's family makes their canned ketchup it like a jam ketchup. It wasn't something I was familiar with until marrying Corey, but it's like a cross between a ketchup, marinara, and jelly. I don't care for it.